I'll Pencil You In T-Shirt. In May of last year I wrote an article in my blog titled I'll pencil you in, about busy people, keeping diaries and the need for my partner and I to make time for each other. At about the same time I thought that heading would be a great slogan for a T-shirt. Artists especially would appreciate the double meaning of penciling someone into a diary and penciling someone in as a preliminary sketch. I was going to create the slogan and put it into my shop (and I may do that yet) but never really got around to doing it (should have penciled that in me thinks). Well move forward about a year and finally the slogan is available from my Red Bubble Gallery. 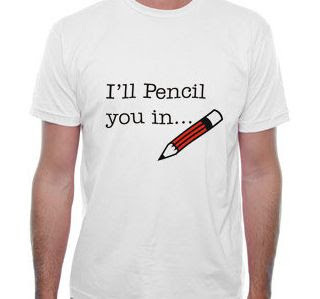 I'll Pencil You In... is just AUD$26.00 and is sold through Red Bubble - an Australian Company. If you'd like to let all your friends know that you've got time for them (tentatively at least) then this is the T-shirt for you. Buy one and support an independent artist whilst you do. Competition with a day job. Copyright Laws - Time to Evolve! What happened to the Video Art? Happiness is a warm EMO. The things you hear in public. If School were a Video Game. The 2007 Gawler Horse Festival. Where to make money with Video. Forgotten by my Phone Company. The Murky depths of my Woolly Head? Blank Canvas III: Art Genius - Art humor.